Dont you hate coming back from work, just to find out that you have more work to deal with at home? I know, i hate it too. Glad that i was recently introduced to Navix by DJ Moments recently, and i would have to say that it does work as a health supplement to reduce stress and at the same time gives you a boost of energy for your body to survive throughout the day. Being VERY new in the market, i decided to write a little review on Navix just so that you have a clearer picture on the taste, effect and formulation. Navix is founded by Dato Jahlilawati, or more well known as Dato Jah, a successful multi millionaire who currently owns BisnesJaya Academy. Conduction trainings, seminars, couching, adn more, she can guarantee improvement in your business right after attending a training session by her. And to expand her achievements, she was thoughtful enough to come up with a product that would help people to counter stress on a daily basis as she finds that stress is a silent killer that not many knows of. Also trying to give other people the opportunity to be entrepreneurs, she has decided to share Navix as a business opportunity to many to help individuals achieve better lifestyles. And that was how Navix was born. Navix is formulated with 3 main ingredients, featuring Ashwagandha, Black Tumeric and Maca, each playing a huge role to reduce stress and as an energy booster. One thing that i admire about the product would be that its made out of natural source of ingredients, which means it contains no chemicals which to me is a major plus point. After all, chemicals are also well known to be very dangerous if its constantly consumed. The existence of Navix is to relieve stress, increase your metabolism and acts as an antioxidant for your body. 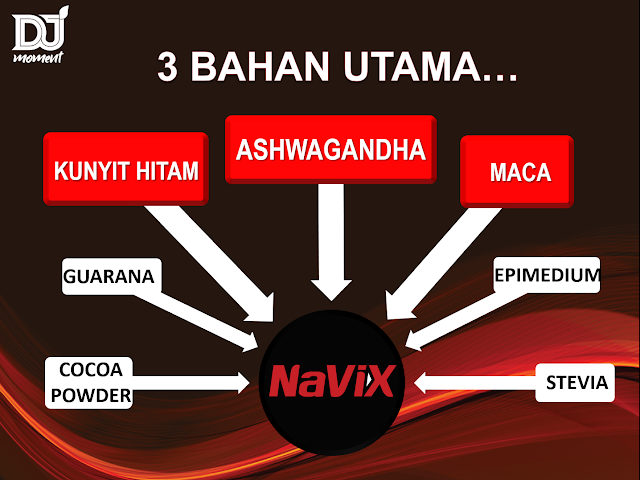 With the 3 main ingredients playing a huge role to Navix, here are some facts on the benefits of each ingredient. Ashwagandha is known as a stress reliever, improves blood circulation, helps to strengthen the body's immune system, and to also give you a boost of energy. Black Tumeric on the other hand is very beneficial for men as it helps to protect the reproduction body system from toxins, improves the quality of sperms and helps to improve any reproductive organs disfunction. And last but not least would be Maca, which contains 19 Amino Acids, Vitamin A, B1, B2, B3, C, D and also minerals. It is said to help provide energy to the body, to improve memory cells and also protects the skin from harsh UV rays. Each pack of Navix comes in a small sachet of 3g, where you can just grab and go whenever you need it. I dont know about you, but im not a fan of coffee, but i was surprised to find that the Navix sachet has a chocolatey flavour! It comes in 2 sizes, where the small box contains about 5 sachets, while the bigger box contains 15 sachets. It would be advisable to consume it every 2 days for best results, but alternatively, if youre like me, you can consume it when you need it. Also kindly take note that this would be suitable to be consumed if youre above 20 years old, not pregnant nor breast feeding and not during surgery recovery. So if you're looking for more details and information, you can always head over to their website for more updates. If youre reading this in 2017, you are one of the lucky ones to be the first few to hear about Navix as its planned to be launched by the end of the year. You can either purchase this for yourself or possibly be one of their trading affiliate if you see potential in the brand. Do not hesitate to contact the number above for business collaborations or for orders. This seems very good and useful for me because im very stress with my works recently. Gonna try this out and thank you for the info.